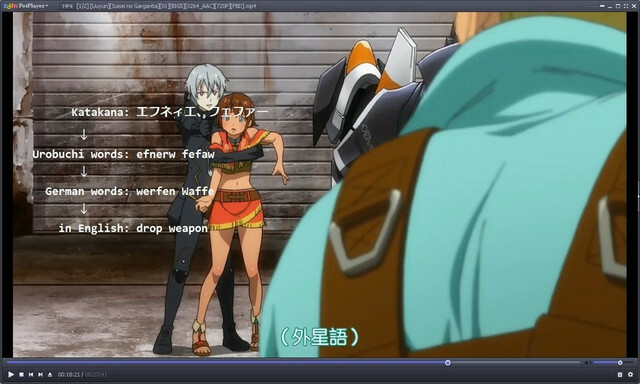 What is the “foreign” language that is used in Suisei no Gargantia? 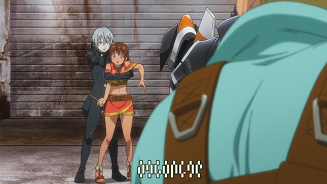 In Suisei no Gargantia, Led (and his civilization) speak a different language from the one spoken on Earth. Depending on the point-of-view, one side speaks Japanese, and the other side speaks the foreign language. Occasionally they switch when the point-of-view shifts to the other side. When Led is talking to Chamber, they speak in Japanese. Dialog coming from everyone else is in the foreign language. 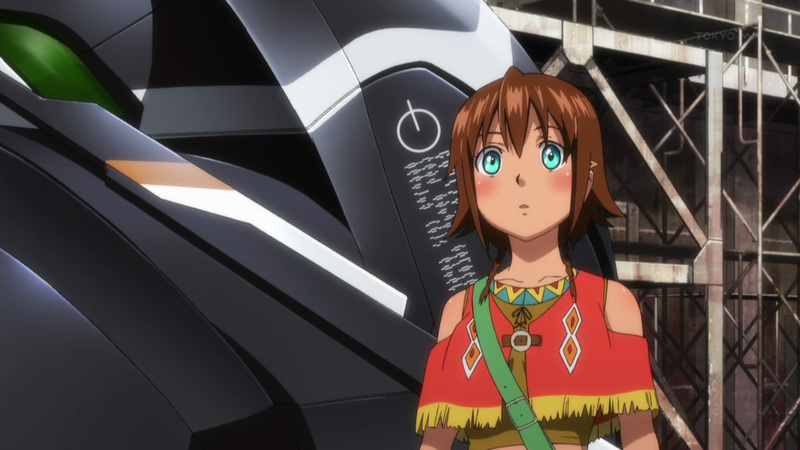 When Pinion confronts Led in the hanger, he and Amy speak Japanese, while Led speak the foreign language. 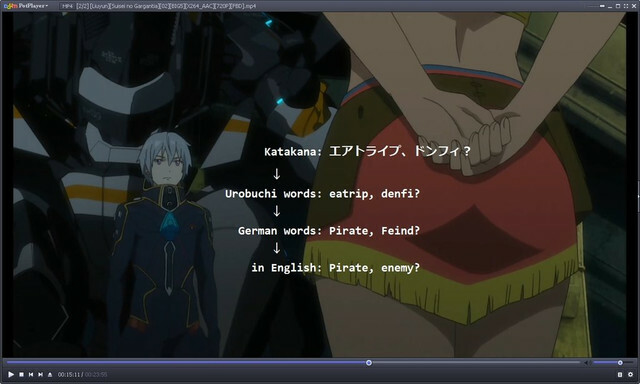 UTW-Vivid subtitles these as symbols that don't look like any real language. Obviously, they don't actually switch languages. 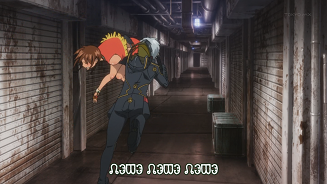 It's only done to emphasize a language barrier that the characters experience. But in any case, what is this foreign language that they are speaking? 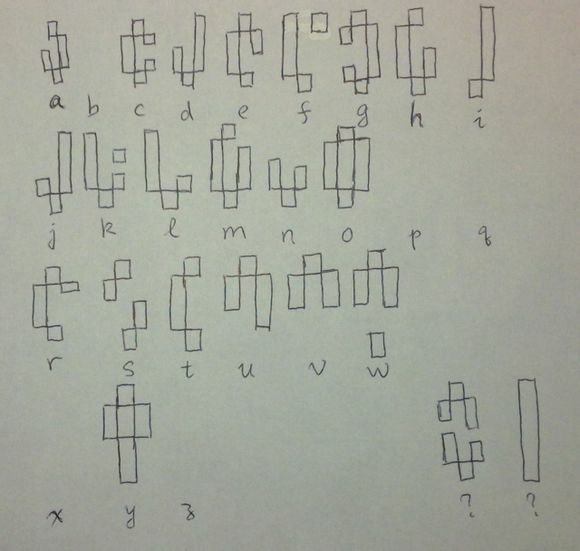 Is it a real language, or just something made up? 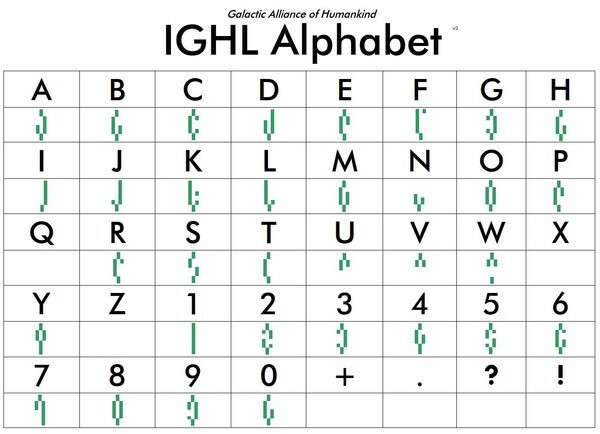 It say "IGHL," probably for "Inter-Galactic Human League" or something. 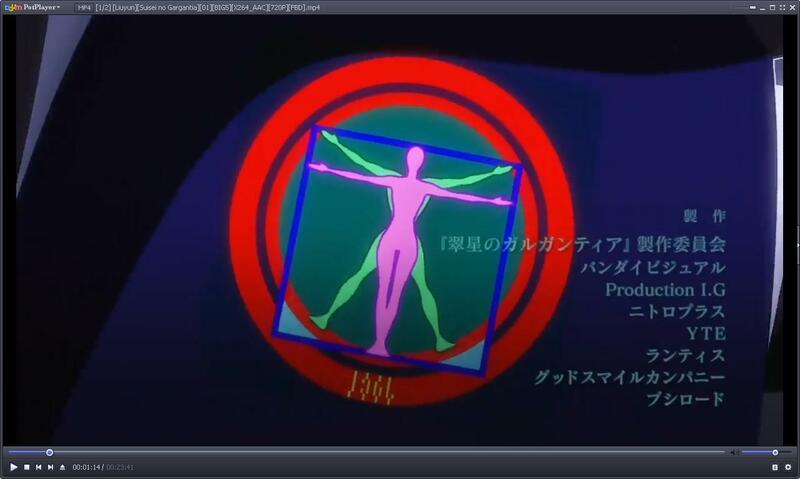 If you look closely at the part where they show a wireframe of the mech on the 3D console, you can make out ciphered text like "equilibrium" and "leg" based on the key above. 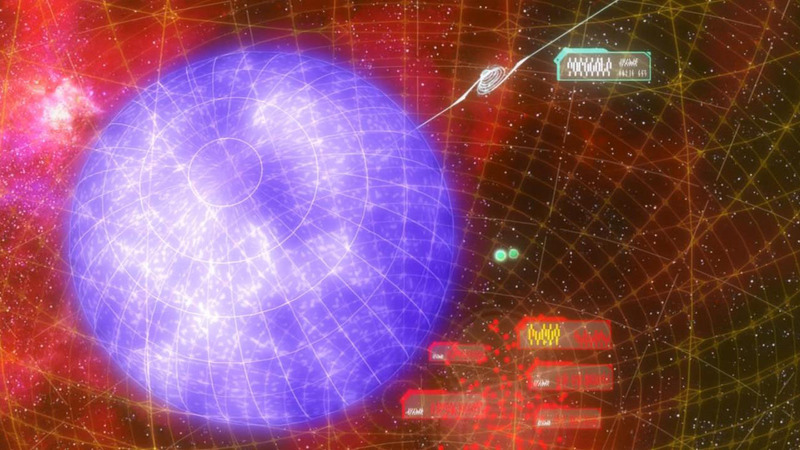 You can see "wormhole" and "enemy" along with some other words on the map display (image). 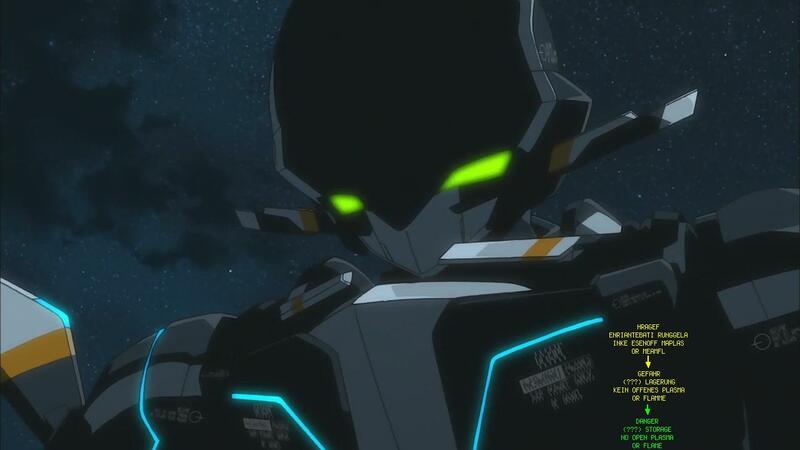 The text on the side of the mech's head (image) is a bit different. 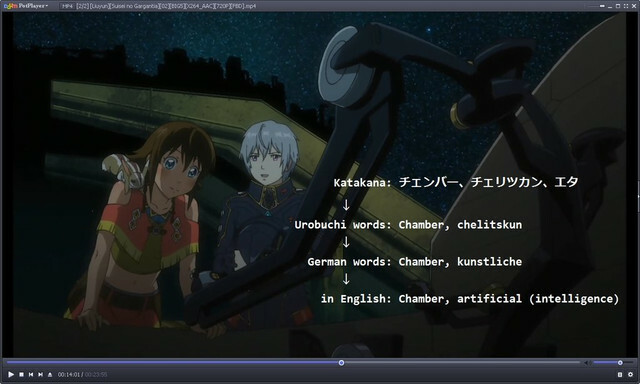 It seem to be scrambled German. "lesen sie das handbuch vor dem oeffnen dieses gremiums"
The text on the front of the mech has also been translated (see image). 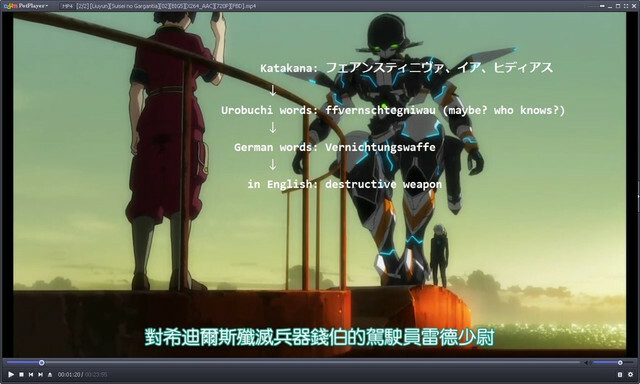 As a side note, the spoken language seems to be English (see image). 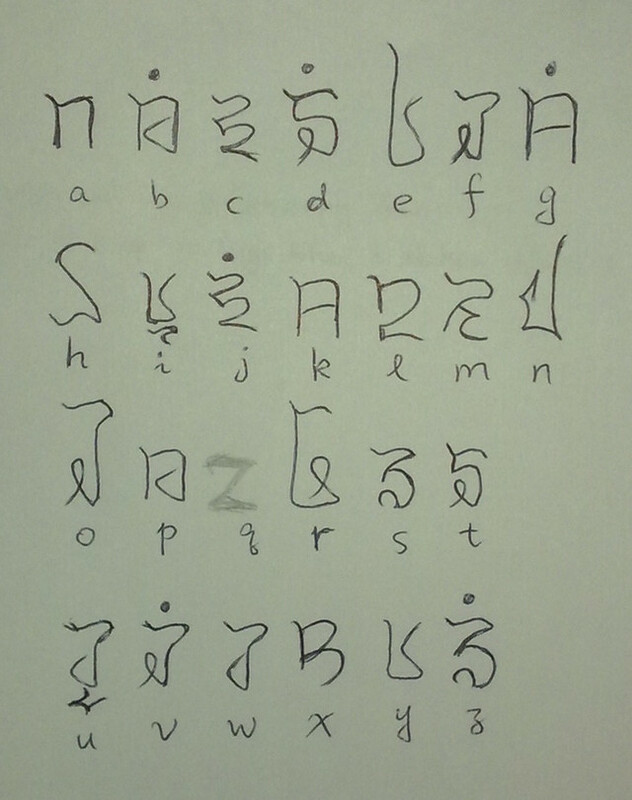 The written and spoken Gargantian language, on the other hand, seems to be romanized Japanese (see images: translated messages, alphabet chart, an alleyway; and see below). The brown books are the Cosmic Atlas. 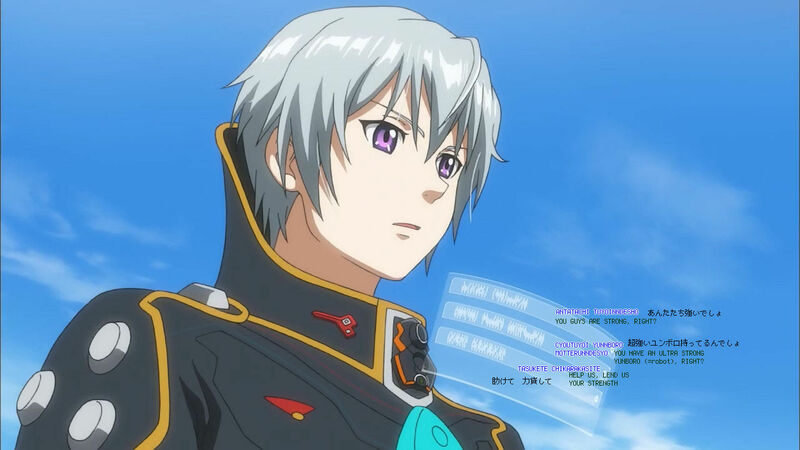 The green one’s title is Totonyan, which is the name of a Japanese art company who are contracted to draw the backgrounds in Gargantia. The cyan one is Satsumakenshi Hayato (in romanized form, in Japanese it’s written as 薩摩剣士隼人), a drama series set in Kagoshima. 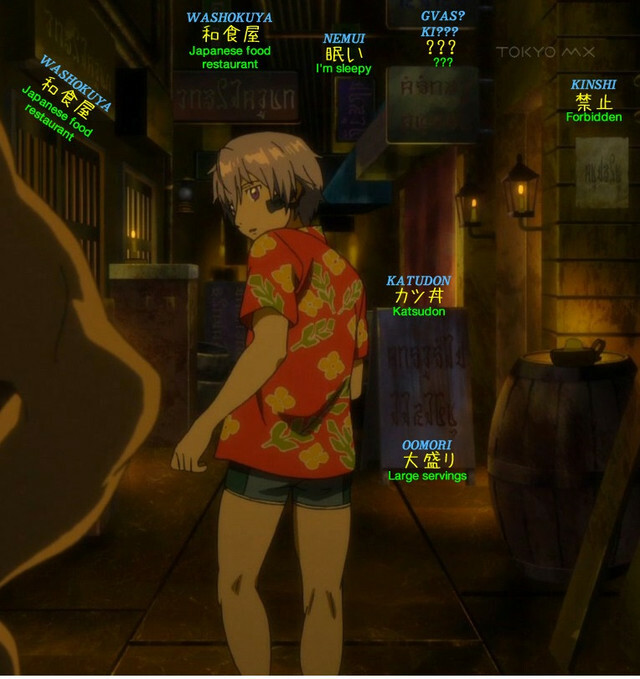 Yep, someone on staff definitely must be from Kagoshima. The magenta one reads Shouyu Tottekure (しょうゆとってくれ, “please give me the soy sauce”), which is apparently a standard example sentence in junior high English textbooks in Japan. The red one says Suiyou Dou Deshou (水曜どうでしょう, “Do you like Wednesday?”), a Japanese variety show. 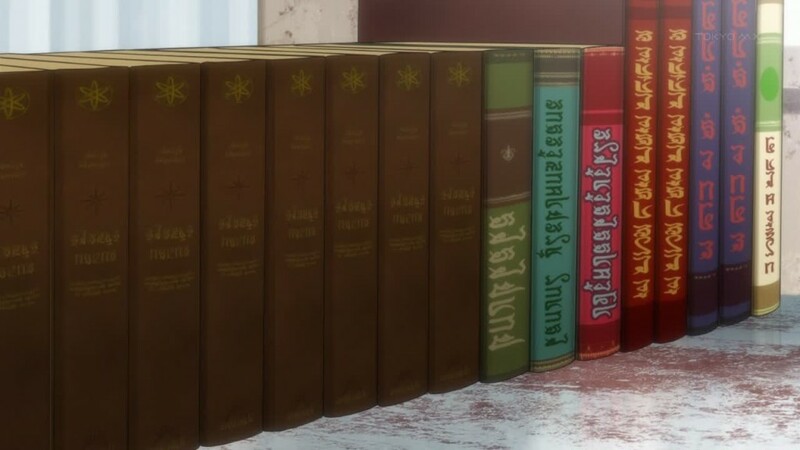 The blue one reads Red Dwarf, which is likely a reference to the BBC sci-fi franchise. The last one is Ryokucha (緑茶, green tea). Not the answer you're looking for? 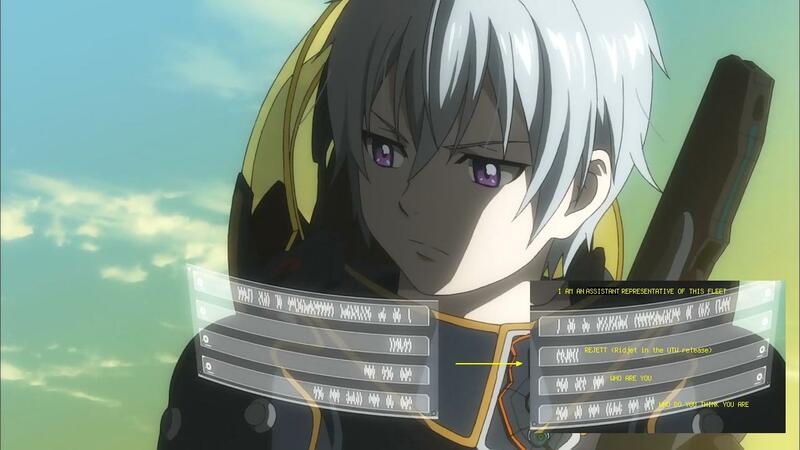 Browse other questions tagged suisei-no-gargantia or ask your own question. Who began the war with the Hideauze?